I’m all about being green. In general. Recycling, upcycling, air miles, composting, you get the drift. But I’m also all about Green exercise. Getting outdoors, into the non recycled air. And for me, that’s one of the benefits! In general you are pretty limited in the gym. Sure you can adjust the incline, but nothing beats the undulating terrain of the outdoors. Working out outside promotes “muscle confusion,” which can help your body burn more calories. Very cool. And it’s totally cool to be green. After travelling through Italy to get there, I was a *little tired and fractious when we arrived at Camp Marlice, in the village Trevignin. So the tiny little cabin was a bit of a shock after our time in Switzerland. Don’t get me wrong, it’s in the most gorgeous area, with views to die for. And the rooms were lovely and cool that we spelt in night- and that’s a definite plus in this heat. But still- there’s no oven- or BBQ. So we might have to purchase one (a BBQ that is!) as feeding the masses on a hob is more challenging than possible, and although there is a microwave- I refuse really to do anything in one other than heat milk- and then only if I have to. To be fair and honest, these cute little cabins are not really made for mass catering, and at least we can all eat outside. This week is purely training with some small events planned so hopefully will be a bit more relaxed and holiday like. I hope. Annecy has the most beautiful lake and the area is used all year round for both skiing and snow sports in the Winter and for hiking and water sports in the Summer. Aix de Bains is our closest town and I’m very much looking forward to the market there in Wednesday. More of that in another post. A little like Scuol in Switzerland, this is also a spa town and was used by the rich and famous for years, now though, since the recession, it’s being promoted as a tourist destination for all. Today’s plan? Not entirely sure- but it will involve some orienteering in a forest not too far away- followed probably by a couple of glasses of vino and a nice French produce meal- salad is sounding attractive considering the cooking facilities! However all is forgotten when we arrive to the coaches house for food and meetings. The view is spectacular, and the company excellent! Last weekend, as part of the Irish Orienteering Championship activities, we naively decided to hold a table quiz. Initially supposed to be held after the AGM in Mount Mellary, it got too late and we moved it to after the prize giving in Lemybrien. I am not a fan of Table Quizzes myself usually as I’m pretty rubbish at them. But was looking froward to putting this together. That is until I actually had to write questions. I decided to come up with the “round” titles first. There would have to be a sports round, current affairs, etc etc. Then I did a Waterford Themed round. Who wouldn’t like a question about Blaas?? Which did get a laugh to be fair. It was quite a struggle to try to get a balance of questions. If there were smaller children playing I wanted to make sure that they would know at least one answer per round, otherwise they might lose interest and start getting creative with activities. I also decided to make the Quiz a bit more interesting by adding in bonus prizes for activities. For example after one round of the Quiz, I suggested a waltz off- which was great fun, mind you the attempt at an Irish Gig was tear worthy. 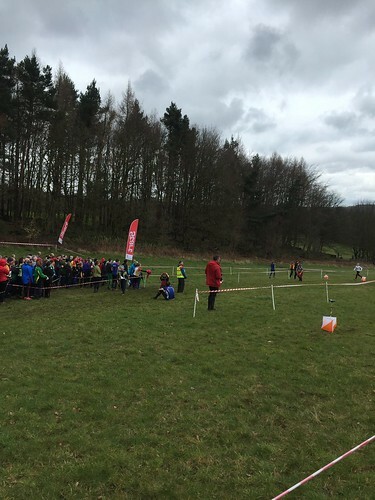 Every year we go to the Jan Kjellstrom Orienteering (JK) event, somewhere in the UK. This is our fifth year attending, and it was the 50th anniversary of the competition itself. We enjoy meeting up with our orienteering friends from all over the world at this event. We normally stay as a group in a centrally located area, but this time the events were quite scattered so we decided on a cheap and cheerful hotel stay off one of the motorways. The first race is an urban sprint. 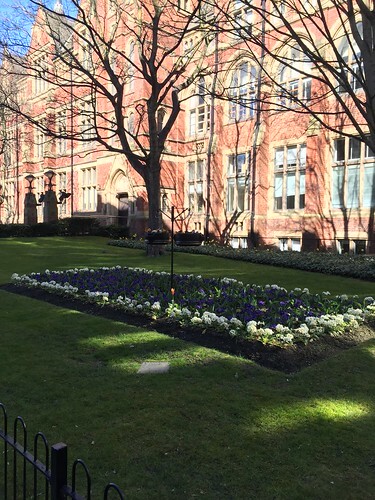 Leeds was the University of choice, and the day was just beautiful. The college is made of of many levels which made the race all the more fun. Sprint is my favourite day. With a little dread while looking at the weather forecast we travelled back to our tiny room! Of course we were all extra excited as knew we were heading to Michael O’Hares restaurant that night. Nigel had managed to secure a last minute cancellation. That experience deserves its own very special blog. The Yorkshire dales are everything I remember from reading about so many years ago. I was an avid James Herriot fan, both in the written and TV form, and even though I didn’t have the first clue where it was based, I knew I wanted to go there. We actually travelled through Thirsk to get to Day 2, and I even saw the practice where it “all happened”. We were very lucky to have four wheel drive, as we got to park within shouting distance of the arena. Some poor unfortunates were parked over 3km away! We had early starts and all finished just before Storm Katie hit with a vengeance. It was very wild and bleak, a little like I had imagined from reading the Herriot books all those years ago! We didn’t hang around but headed back. The arena was perched on top of the hill so it was a tad windy and cold at that stage. Normally in JK competitions the walk to the start is nearly longer and more arduous than most of the courses. But this time it was the walk to the finish that- literally finished us off! Wass forest you got the better of me. Until we meet again! Day 3 was nearer to the Lake district. There was an issue with parking so we got the bus from the communal car park, and then had a short walk “UP” to the arena. (As an aside there was a lovely sand arena – dressage letters the works beside it). This was a slightly longer walk to the start, but not as hilly on the run. I did far better this day, but really took my time (i.e. walked up all the hills) and really felt my orienteering was good. Jords finished ahead of me, and we had just put on our coats when the first of the hail showers hit. Poor Nigel was on the last 1/4 of his course and came back frozen. That’s the biggest downside of having to get a bus, you can’t bring all your stuff, and then noone hangs around cause they’re frozen. The relay day dawned very cold. So cold we were all very silent as we made our way to the arena. Due to injuries and tired legs, poor Jords was the only one who had to run. But it meant that we were both there for her. The relays are great fun, and it’s good to dissect the previous days with our JK friends. Jords had a great run as middle leg for her team, so we ended the weekend on a high. Now for a drive through Snowdonia, and a last night in Wales. See you all next year for JK 2017 in England. Due to injury, and an impending foot procedure. I’m walking, not running at the moment. Recently 2 friends of mine have done part of the traditional Camino Way, and we were discussing it at length. I didn’t realise that there were many walks on again off again you could do. Although primarily a Catholic pilgrimmage, the thoughts of walking through untouched countryside, with no real agenda strikes me as being a very good idea. And from talking to various people who have done it, the religious experience is not always the primary reason for taking part. I thought, from first glance,that the “Arles” route, seemed appealing, until my better half told me about the not insignificant “hills” there are there. But the French routes appeal to me. This is the book that we used most the last time we travelled through France. And although it’s primarily driving routes, it is next to near impossible not to stop in the villages and stroll around. This also gives you time to think. A little like the Camino I imagine. This weekend we are up in Portstewart/ Limavaddy again for more orienteering. This time it’s the Junior Home Internationals. Jordan is competing for the first time, and the excitement is building. Wearing the Irish Jersey is not something to be sniffed at. The Northern Ireland Championships are on at the same time, which I had entered. But now I’m not so sure. It’s too late to cancel the entry, so I think I’ll just walk around. The problem is once I stop running I find it very hard to get back into it. The time you had allocated to running suddenly gets swallowed up into something else. And now that I am pain free, while walking, driving and riding my Missy, I don’t really want to get back into a situation where I have to take painkillers again if I overdo it. The anti inflammatories made me feel ill, which made me generally unpleasant to live with! But at this stage I think I’ll just wait and see. On the positive side, it’s on sand dunes, which means it’s relatively flat. And I certainly won’t start if Jords hasn’t finished her run. But I’m in such need of just doing nothing for a weekend, I think sitting quietly with a book is also appealing. Now just to find a book…. As a family we travelled to Nairn in Scotland for the 2015 World Orienteering Championships which were run in conjunction with the biannual Scottish Six Day. It’s a long way up, but the scenery is just gorgeous. We were based in Nairn, a seaside town with a really beautiful stretch of beach. We spent some of the time in Forres, where the sprints were held. Shakespeare’s play Macbeth, sets Duncan’s castle in Forres, and the three witches met close by. Whereas Macbeths castle itself was in Inverness. You can see how the location influenced the play. When Shakespeare was writing Macbeth, James I was on the throne, he had previously been James VI of Scotland. James was fascinated by witch craft and its widely believed that Shakespeare introduced the witches to curry favour. The real Macbeth reigned in Scotland from 1040 to 1057.Shakespeare’s Macbeth is one of the most iconic characters ever created. But few people realise that Macbeth was also a real man, a king of 11th century Scotland who led a life filled with as much murder, treachery and drama as the tragic hero of Shakespeare’s play. We also spent two days in Darnaway, the seat of the Earl of Moray. The house is really spectacular. I especially liked the tree house with its stained glass window,…. The grounds were truly fabulous to walk around, and what I wouldn’t give to put a couple of sand arenas in the mahoosive walled garden. The woodland on these estates has been actively managed for over 250 years, part of Darnaway has been forested for over 1000 years, it was formerly a hunting forest. The oldest tree in the forest is approximately 750 years old. To the south of the castle, the river Findhorn runs through a gorge. Where “Long jumping” was made popular by the likes of Rob Roy Macgregor. For shopping you really have to go no further than Brodie Countryfare. I could have spent an absolute FORTUNE. It’s a real gem, and the homemade ice cream is a must! Although it’s a little annoying having to pay for it separately. I was INCREDIBLY restrained and only bought a present for my sister-in-law. But it’s up there with another great Scottish gem, the House of Bruar, which is in a most picturesque part of the world. Travelling back home we took the route along Loch Ness and Loch Lomond down through the national parks. Loch Lomond was more impressive than Loch Ness as you could see more. We were very disappointed that the viewing points around Ness were so few and far between. Also to see Urquhart Castle you have to pay a fee, which I feel is a little unfair. As one of the largest castles in Scotland, and one that was pivotal in the War of Scottish Independence in the 14th Century, it was a pity not to even be able to walk around it. This picture is care of Scotland Guides, as we weren’t able to access it. Travelling on along Loch Lomond it was wonderful to see the Scottish mountains in all their glory, then on through Fort William passing the majestic Ben Nevis. It felt like we were driving through the set of Skyfall. When we travelled to Portstewart last weekend, I never expected to be dining in style. But a facebook friend said to visit Harry’s Shack while we were in the area, and we suddenly grinned from ear to ear. We had visited harry’s restaurant, Bridgend in March 2014, and “knew ” Donal from Twitter. We had the most amazing meal, and knew that when the sister establishment opened the summer of 2014, that we would have to visit. We were heading into Coleraine to do some shopping and were hoping to get to Portstewart Strand in time for lunch, but with the air show on in Portrush, we were unsure about the traffic and subsequent restrictions. but the eating Gods were with us, and we arrived in perfect time, and got a fabulous table overlooking the strand. The menu, from the looks of it, is changed daily, and with specials made for good reading. We shared the battered white bait to start, but very nearly ordered the prawns. For main course I asked permission of the bill payer as to whether I could have my choice of half lobster. Of course he agreed as he was going to be getting a taste. Nigel tried the recommended whole sole special, which just tasted fabulous, and was served with a bowl of mashed potato. As we are both trying to “Be good”, dessert was to be shared, mind you I was absent when it arrived to the table, and was very surprised that it was still there when I came back. We had been tweeting with harry’s throughout the meal and they said not to go without trying the pistachio macarons. But I just couldn’t fit another bite. It does give a reason to come back- see you at the end of October!!! The Junior Home Internationals are on near Portstewart at the end of October. In preparation for the event there was training for the Junior Athletes nearby. Nigel and myself had offered to cater for this Athlete group, and as always we were slightly apprehensive as to the quality of the kitchen. The hostel was very well located for all the training, and we were delighted to see the kitchen was excellent! We arrived very late due to my GPS being stroppy and bringing us the “scenic” route in the dead of night… and to be fair, it is at the opposite end of the country. The hostel was easy to find and we quickly unloaded all the food into the fridge, said hellos and goodbyes left for the night. The brief was healthy food, fit for athletes. We started the right way with porridge, fresh fruit and home-produced honey. Scrambled eggs and freshly made soda bread were to follow, and everyone went off with full happy bellies. Dinner was going to take a while as I cook beef pieces in the chilli for better flavour, instead of mince. Also I make the Colorado sauce as the heat factor, instead of using chilli powder. I find that it gives the heat to the dish without overpowering it. Mind you, I ate my lunch on friday after making this hot sauce, and although I was SUPER careful about washing my hands afterwards, my cheese sambo was NEVER so hot! I cook the chilli in the oven slowly for 3 hours, this oven was a gas oven, and did not heat aswell as I’d would have liked so the resulting sauce could have been thicker. For a little extra we served it with baked potatoes, sour cream, coriander and nachos. Salad and a big bowl of homegrown tomatoes finished the main course, and there was barely a scrap left, thank goodness. Dessert was apple crumble with ice cream, seasonal and flavoursome, this dessert was almost the stick that broke the sous chefs back. One of the parents had very kindly donated apples to the cause, and they took a while to peel, but were absolutely delicious, Beauty of Bath are a great old variety. Unfortunately we were up to our oxers in prep at that stage so there’s no picture. I was delighted at how little food we had left over, and even though we ran out of bread (I made more soda bread in the morning- glad I’d weighed them all out), everyone went off with full bellies! Nigel and I got a lovely email from one of the parents this morning, and even though we were both exhausted getting up Monday, it made it all worthwhile. 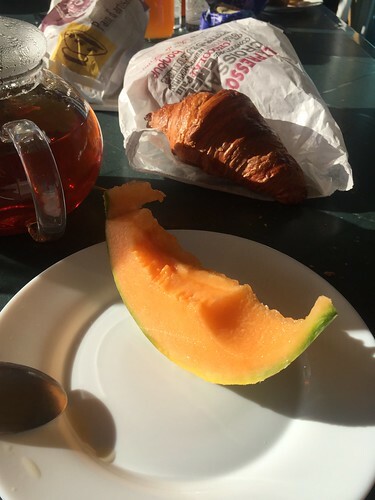 “As I munched on porridge at 0630 earlier today I knew there was something missing … the fresh cut fruit, the delightful honey, the waft of baked bread, the prospect of fluffy scrambled eggs as well as the extraordinary graciousness, sense of purpose, organisation and good humour you brought to all our plates and lunches over the weekend.” John. So many people give up their time and energy to train these Athletes, and athletes from other disciplines, that if all I do is give them a good meal at the end of the day, it’s been worth it! He’ll be completely mortified. But won’t even be in the country, so I can basically I can do what I like. My baby boy is 17 today. And I couldn’t be a prouder mother, of both my kids, but today I’m focusing on Robert. From the minute he arrived- ten days late, he lit up our lives. And those lives around him. And hasn’t stopped since then. He’s always loved the outdoors, and has embraced it fully over the last number of years with his orienteering. And he also loves to cook- definitely in the family tradition- and is officially head food stylist when I’m trying to sort my shots out! And every time he’s on stage- I simply burst with pride. This is our 4th JK, we started in Scotland, moved to Reading, then visited Wales, and this time, we are in the Lake District. One of the Junior Squad parents had found a caravan park within easy driving distance to the three events. 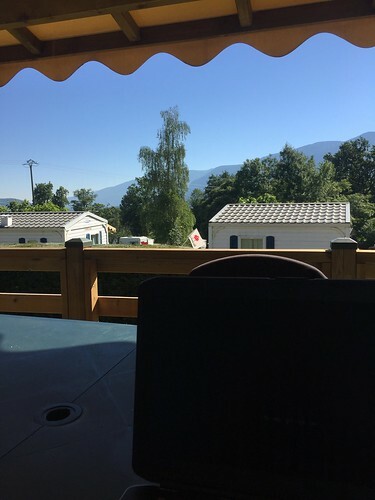 Crake Valley Holiday park is just beside Coniston Water, and although there isn’t exactly a lake view, the trees around us are what we are use to, and the peace is welcome. Day 1 was the sprint event in Lancaster University. I think at this stage we are getting use to sprints, and I actually enjoy them, although due to injury, forcing yourself to walk around is difficult! But I only broke into a gentle jog at the finish, and was delighted to have only made one small mistake. All family members completed their respective course, with Robert running an especially good race. Day 2 dawned sunny and hot, as we have come to expect with the JK, the first obstacle is the walk to the arena, the second is the walk to the start. I remember going to my first start in Scotland, we had to climb a sheer rock face, and it definitely easier to come back down while orienteering through the forest than to get back down the way we had come. I digress! Getting into the field was better than we thought, outlander did her usual excellent job of getting us into the field. The journey was a long, steep and muddy walk to the arena, through beautiful dells of wild daffodils and wild garlic, sometimes the smell was almost overpowering! With wet feet, and slightly tired legs we deposited our gear and set off for the starts. Our start had been written as a half hour walk, half on roads, have through forest, but turned out to be shorter- thankfully. What I was not expecting were the viciously steep climbs and descents. Scary stuff, reports of a number of dislocated shoulders and concussions did not surprise me. 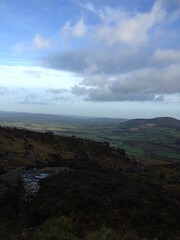 Due to dodgy ankles and knees my ascents and descents were all calculated and painfully slow. You also had to be very sure you were on the right track, you certainly didn’t want to go down to the bottom to discover that the control was at the top. There were a lot of wandering orienteers out there. 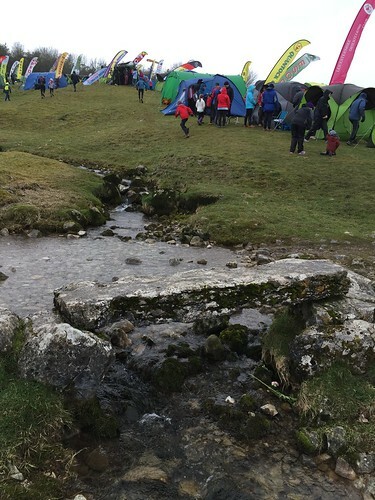 But this year the atmosphere was more relaxed I felt, as it is a competition you are not encouraged to help others, but if someone looks lost and is quite obviously wandering aimlessly, I feel it does no real harm to help them locate. It is supposed to be fun after all, and from experience I know that wandering around for hours lost is no fun at all. I can honestly say travelling at a slower pace, and not worrying about tiredness helped my orienteering immensely. It did mean I was close to being last, but other than struggling up and down for most of the course, I was happy with my navigation. And once again we had family completion. Day 3, was a little less of an effort to the start, which was a relief as my calves were a “tad” sore. The arena was at the bottom of a hill, which we had to climb over first, and although it would have been nice to have our own tent, it was great to not have to carry it. My jeep again played a complete blinder, many other cars and “jeeps” struggled quite a bit, my baby, was an absolute star. The course, although longer, seemed to flow better, my number 5 was an epic struggle uphill, and took quite some time. In essence, if you can’t use you compass then really today, and yesterday really would have been a struggle, or a baptism into contour orienteering. And onto the relay… but that’s for another post. I definitely need to stretch.